Zimboinlimbo: A visit to the dentist. Last week Bryan started talking about the dentist. He said something like "I need to go to the dentist. My filling fell out a squillion years ago and I have not had it fixed. My tooth is breaking were the filling fell out" At this point I tuned out. What I took from this was Bryan is talking about going to the dentist. I know that at some point he may have asked me if I needed to go to the dentist. Now I am a semi-hypochondriac so of course I KNOW that I need to go to the dentist but that does not mean that I am planning to go just that I know that maybe I should go and get a check-up or get my teeth cleaned and in the process find out that I have to have all my teeth removed and get dentures or screw ins or something and it is all just too horrible to think about. So I may have said something like "Yeah, I probably need to go to the dentist" and then moved on with my life. Fast. Over the weekend Bryan told me that he had booked an appointment on line. I made interested noises, I assumed he was thrilled at the fact that he could book an appointment on line. Because, snakes alive, not even Bryan could think that booking a dentist’s appointment is news for anyone other than the person going to the dentist. Which was not me. On Saturday night as I was nodding off to sleep Bryan said "Now remember you will be going to work late on Monday because of the Dentist” I thought he was rubbing it in a bit much on his whole dentist malarkey. In all the years we have been together he has never shared so much bloody information about any bloody appointment and how did him going to the dentist affect me getting to work late. I would take a taxi. Job done. Anyway it was very late and I thought "oh I am too tired to actually transfer my going to bed mode brain to engage my faculties and talk mode brain" so I muttered snuffley noises (to indicate that I heard him) and went to sleep. On Sunday night at around the same time (i.e. just before I dropped off to the land of Nod) Bryan said "Don't forget WE have the dentist tomorrow". My whole body was awake in nanoseconds. "We?????? What is this 'we' Pale Face?" I asked incredulously. Bryan sighed. You know the kind of sigh. The patient sigh. And used his I am a grown up patient voice. "Penny I have been telling you all week that I have booked a dentist appointment for US" What the hell? Never, ever have we gone to the dentist together. The only times we ever did anything vaguely medical together was when I gave birth to the boys and when I had to give my permission in front of the doctor for Bryan to have a vasectomy (that is another story and not for this forum.) What the hell? My health is being hijacked by my husband. "What are you talking about?" I started my rant. "At no point did you say that I was going to the dentist with you. I did not ask you to book me a dentist appointment. What the hell?" I squealed. Visions of bloody mouth cavities filled my mind. But the appointment was booked, so off I went...... with Bryan. The dentist told me that my mouth and teeth were all in very good order and all they needed was a clean and really why had I come, I was not due for a check-up. Well that gave me an opening to pour out my woes. How I was hoodwinked into visiting the dentist (bet that made the dentist feel good about his profession) and how I was very glad to hear that I would not have to see him again for quite some time (again, winning comments to make to a person who can cause you great physical pain) and how my husband was going to get a full treatment of smugness from me. I distressed and amused the lovely dentist in equal measure, I think. I am all right on the dental scene. Bryan on the other hand has ground his teeth almost to the roots. 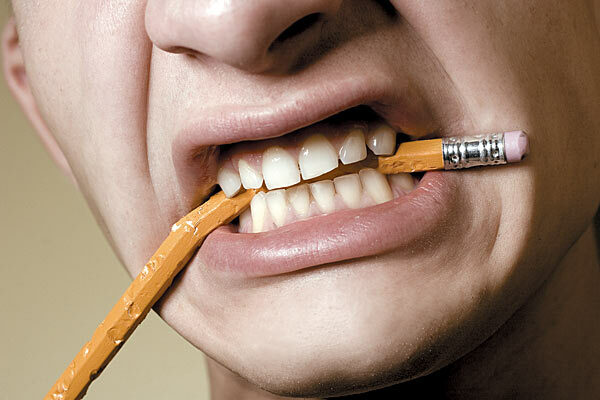 He has gnashed and bashed his teeth to the point that they have stress fractures (just like mountains under the pressure of the tectonic plates I am guessing) and splintering shards of enamel cracking away from his teeth and has been instructed to hold a pencil between his teeth when he works to protect his gnashers from his strong grinding jaw. Ha, Ha, Ha! All this in addition to the gum guard that he already wears while sleeping to stop him grinding away at what is left of his bite. I have a game that I like to play with his gum guard. I wait till he has it in his mouth and then I will start a conversation so that he has to take it out. I don't do it often, just every now and then to mix up our bedtime routine a bit. Did I mention that I have a healthy set of teeth? That is such a great picture. 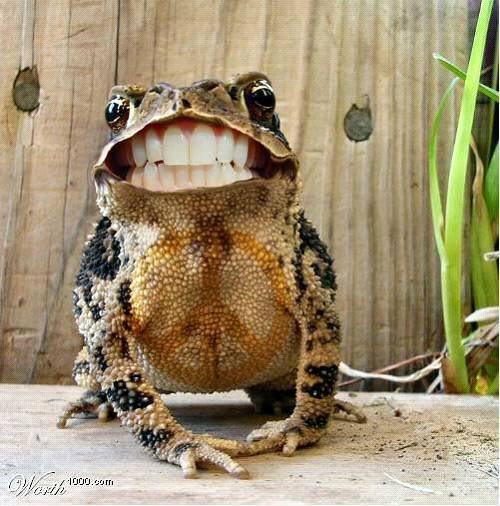 Whoever did the photoshop job on that frog is good at what they do. I have been trying to learn how to use photoshop for the past 2 years and I am still struggling with it. I have learned the basics so I can create things fairly easily. But I need to learn shortcuts. A very entertaining read but why does Bryan grind his teeth his so much? Have you looked into having him sleep while sedated? It doesn't seem like that would be good in the long run for his teeth. Keep the entertaining posts coming and wish Bryan well on the future of his teeth. Moving to Jebel Ali. Al Muntazah here we come.